If you’ve been looking for a sleep supplement which has all of the time-tested ingredients, EVLUTIONNUTRITION SLEEPMODE is worth considering, as you’ll find out in this review. Impressive formulation. Features just about all of the time-tested sleep support ingredients. GABA-boosting ingredients. L-theanine, valerian powder, and another 100 milligrams of GABA ensure you sleep like a baby. No glaring weaknesses. Yet another impressive sleep support product from the manufacturer. Other Ingredients: HPMC, Microcrystalline Cellulose, Silicon Dioxide, and Magnesium Stearate. Directions: As a dietary supplement, take 1 serving (2 capsules) 30-60 minutes before bedtime or as directed by your health care professional. Take only once daily and use only as directed. If you’re into bodybuilding, exercising regularly, eating healthy, and supplementing soundly (particularly with protein, post-workouts, and pre-workouts) should work wonders. However, if you neglect your sleep, you won’t get good results. The simple takeaway: lack of sleep is an impediment to serious gains. Train and eat healthy all you want, but if you don’t get enough shut-eye, you’re throwing it all away. Good thing you can choose from a wide array of sleep supplements on the market. One of the best we’ve seen to date is Olympian Labs Melatonin Fast Dissolve – its impressive formulation and reputation make it one top-notch product. Another one is 360 Cut 360DREAMS – its high valerian root extract and GABA-boosting content should help you sleep like a baby. 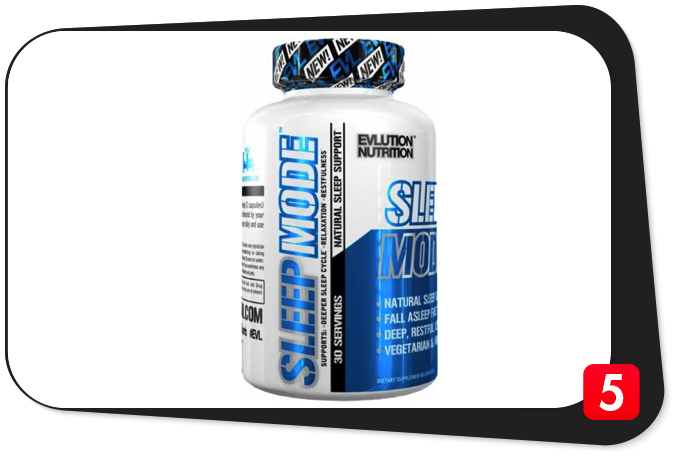 EVLUTIONNUTRITION SLEEPMODE’s impressive formulation should help you sleep like a baby. Now, make way for an emerging player known as EVLUTIONNUTRITION SLEEPMODE. The manufacturer dubs it its “Natural Sleep Support” product which is “formulated to support natural, restful sleep so you can wake up refreshed,” per its official website. We consider that a good description. A great sleep supplement helps you fall asleep faster, stay asleep longer, and wake up refreshed. In other words, it covers all the sleep bases. We’re crossing our fingers EVLUTIONNUTRITION SLEEPMODE does just that. One serving (two veggie capsules) of EVLUTIONNUTRITION SLEEPMODE takes up approximately 1.005.5 grams. The company’s other big-name sleep supplement, EVLUTION Z-MATRIX, relies mainly on vitamins (vitamin D3 and vitamin B6) and minerals (magnesium and zinc). Not so with EVLUTIONNUTRITION SLEEPMODE – its formulation relies more on time-tested sleep ingredients. Leading the charge is 200 milligrams of l-theanine per serving. This amino acid and natural ingredient of green tea has a reputation for quelling anxiety, which, in turn, helps one fall asleep faster. That’s because the brain converts l-theanine into GABA, the popular inhibitory neurotransmitter. Moreover, l-theanine also helps offset the stimulatory effects of caffeine. No wonder you can find this amino acid in many pre-workouts formulas such as 4 Gauge. With l-theanine around, you won’t feel too wired way after you finished your last rep at the gym. We’re confident EVLUTIONNUTRITION SLEEPMODE’s l-theanine content will exceed your expectations. Many individuals experience those issues. Long story short, these can be frustrating. When one supplements with valerian root extract, he or she can nip this issues in the bud. As a bonus, experts also say valerian root extract helps promote healthy blood pressure levels. We think it’s great, to say the least. EVLUTIONNUTRITION SLEEPMODE’s valerian root extract levels may not be as high as those of, say, 360 Cut 360DREAMS (which has a whopping 1,000 milligrams per serving), but it’ll do. We’re optimistic it’ll complement its l-theanine component perfectly. “Although valerian is thought to be fairly safe, side effects such as headache, dizziness, stomach problems, or sleeplessness may occur,” per Dr. Brent A. Bauer of the Mayo Clinic. This product’s third key ingredient is chamomile powder (Matricaria chamomilla)(flower), which takes up 150 milligrams per serving. This is a flowering herb and another staple sleep supplement component. The secret lies in its apigenin content – an active compound which helps induce feelings of relaxation. Any time an ingredient gives you benefits beyond its intended purpose, it’s a huge bonus. That’s precisely what chamomile can do for you: not only will you sleep better, but you’ll also boost your long-term health. Next up are 100 milligrams of l-tryptophan per serving. This amino acid helps increase levels of the neurotransmitters serotonin and melatonin (another key ingredient of EVLUTIONNUTRITION SLEEPMODE), which both help improve sleep quality. According to a study which Canadian researchers conducted in 1989, l-tryptophan helps reduce sleep latency depending on one’s blood levels. This means EVLUTION NUTRITION SLEEPMODE’s valerian and l-tryptophan components should make you fall asleep faster. That’s good news for many insomniacs. The next ingredient is passion flower extract (Passiflora incarnata)(whole herb), which takes up 100 milligrams per serving. This is yet another component which helps quell anxiety for better sleep quality. Passion flower also helps regulate blood pressure levels, improve insulin sensitivity, and ward off the effects of menopause. Just like chamomile, passion flower is another bona fide health vitruoso. We’re stoked it’s in EVLUTIONNUTRITION SLEEPMODE. Next up are 100 milligrams of lemon balm extract (Melissa officinalis)(whole plant)(aerial) per serving. This ingredient is also another anxiety buster. Some studies stay combining lemon balm extract with valerian helps quell anxiety significantly. We agree with this assessment: both components have stood the test of time. We’re positive they’ll help you sleep longer and better. EVLUTION NUTRITION SLEEPMODE seventh key ingredient is hops extract (Humulus lupulus)(flower), which takes up 100 milligrams per serving. Believe it or not, this herbal ingredient is an ingredient of beer. “Clinical trials with hops gave satisfactory results as the improvement of sleep quality in patients with insomnia is concerned,” per the January 14, 2012 issue of Journal of Sleep Disorders & Therapy. Simply put, you don’t have to drink beer to enjoy its sedative effects – one serving of EVLUTIONNUTRITION SLEEPMODE should do the trick. Another key component is GABA (gamma aminobutyric acid). This is the main inhibitory neurotransmitter of the central nervous system (CNS) which takes up 100 milligrams per serving. Some experts believe people who have sleep issues have low GABA levels. In addition, GABA helps keep inflammation at bay (which results in improved cardiovascular function), increase focus, and ramp up human growth hormone (HGH) levels – a benefit which many bodybuilders seek. Like we said, both l-theanine and valerian powder increase GABA levels. When you supplement with EVLUTIONNUTRITION SLEEPMODE, you’ll enjoy a triple dose of GABA for better sleep quality. The last key ingredient is melatonin powder, which takes up 5.5 milligrams per serving. This is a hormone which the pineal gland secretes. It helps maintain one’s circadian rhythm, which “is basically a 24-hour internal clock that is running in the background of your brain and cycles between sleepiness and alertness at regular intervals,” per the National Sleep Foundation’s official website. Think about that time at night when you feel sleepy and the time when you normally wake up in the morning. That’s your circadian rhythm or sleep-wake cycle. Your melatonin levels help regulate this process. We’re confident this supplement’s 5.5 milligrams of melatonin per serving will go a long way. Our first impression: EVLUTIONNUTRITION SLEEPMODE, the so-called “Natural Sleep Support,” pulls out all the possible stops. If you’ve been searching long and hard for a product with all the essential sleep support ingredients, this is it. With that, EVLUTIONNUTRITION SLEEPMODE should give the likes of EVLUTION Z-MATRIX a serious run for its money. L-theanine, 200 mg: An amino acid, natural ingredient of green tea, and GABA precursor which helps quell anxiety, keep stress levels in check, boost weight loss, neutralize the stimulatory effects of caffeine, and enhance cognitive function. Valerian powder (Valeriana officinalis)(root), 150 mg: An herbal ingredient which helps ramp up GABA levels, reduce sleep latency, and regulate blood pressure levels. Chamomile powder (Matricaria chamomilla)(flower), 150 mg: A flowering herb which helps induce relaxation, keep free radicals at bay, boost immunity, regulate blood sugar levels, and improve cardiovascular function. L-tryptophan, 100 mg: An amino acid which helps increase the levels of the neurotransmitters serotonin and melatonin for better sleep quality. L-tryptophan also helps reduce sleep latency like valerian powder. Passion flower extract (Passiflora incarnata)(whole herb), 100 mg: A flower which helps quell anxiety, regulate blood pressure levels, and improve insulin sensitivity. Lemon balm extract (Melissa officinalis)(whole plant)(aerial), 100 mg: An ingredient which helps quell anxiety for better sleep quality. Hops extract (Humulus lupus)(flower), 100 mg: An herbal ingredient one can find in beer which helps improve sleep quality. GABA, 100 mg: This is the main inhibitory neurotransmitter of the central nervous system (CNS) which helps improve sleep quality, ward off inflammation, and increase focus and human growth hormone (HGH) levels. Melatonin, 5.5 mg: A hormone which helps maintain one’s sleep cycle, keep free radicals at bay, boost cardiovascular function, ease jet lag, and improve bladder health. The so-called “Natural Sleep Support” pulls out all the stops: if you want a sleep supplement which has all of the essential ingredients, this is it. Whenever a product includes time-tested components, you will get results. EVLUTIONNUTRTION SLEEPMODE will do just that. If you scan the supplement facts, there isn’t one key ingredient which will raise an eyebrow. You can’t go wrong with a combination of l-theanine, valerian powder, chamomile powder, l-tryptophan, passion flower extract, lemon balm extract, hops extract, and GABA. Experts have vouched for these, and so do we. We love the inclusion of l-theanine. Not only will it help ramp up your GABA levels and quell anxiety, but it’ll also offset the stimulatory effects of caffeine. If you’ve had one cup of Joe too many during the day, this will do the trick. Speaking of GABA, ingredients such as l-theanine, valerian, and another 100 milligrams of GABA will make sure you get your fill of this important inhibitory neurotransmitter. Some studies suggest low levels of GABA may results in sleep issues. The good news: when you supplement with EVLUTIONNUTRITION SLEEPMODE, you don’t have to deal with those. This may be a relatively new product, but customers are already singing its praises – they say it has exceeded their wildest expectations. Consumers claim EVLUTIONNUTRITION SLEEPMODE helps them fall asleep faster, sleep longer, and wake up refreshed. Any time a sleep supplement covers those bases, it gets our vote. This product also displays excellent transparency – the manufacturer breaks down all of the ingredient amounts. You won’t find any shady proprietary blends here. Plus, EVLUTIONUTRITION SLEEPMODE has no fillers. These are awesome, to say the least. Just like its predecessor (EVLUTION Z-MATRIX), EVLUTIONNUTRITION SLEEPMODE has no glaring weaknesses. With that, the company is gaining a reputation as one of the best in manufacturing sleep supplements. If you want high-quality sleep support products, you should consider EVLUTIONNUTRITION’s products. The final takeaway: EVLUTIONNUTRITION SLEEPMODE is the real deal. If you’ve been tossing and turning in bed for quite some time, this sleep supplement should help you sleep like a baby in no time. It’s a bona fide game changer. We agree with these claims. EVLUTIONNUTRITION SLEEPMODE is one sleep supplement which should give you a fast return on your investment. The manufacturer intended EVLUTIONNUTRITION SLEEPMODE for healthy individuals who are at least 18 years of age who want to fall asleep faster, sleep longer, wake up refreshed, shorten recovery time, improve their overall quality of life, and achieve their daily fitness goals. 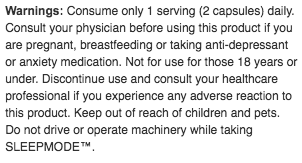 While EVLUTIONNUTRITION SLEEPMODE has no glaring side effects, please consult your physician if you feel doubtful about any of its ingredients. Contains l-theanine. Amino acid which helps offset the stimulatory effects of caffeine. GABA boosting-ingredients. L-theanine, valerian powder, and another 100 milligrams of GABA ensure you sleep like a baby. Great transparency. Manufacturer breaks down all of the ingredient amounts. Awesome reputation. Customers have sung this product’s praises. No glaring weaknesses. Simply a solid sleep supplement from top to bottom. EVLUTIONNUTRITION continues to roll out top-of-the-line sleep supplements. EVLUTIONNUTRITION SLEEPMODE is the epitome of a product with time-tested ingredients which should give you great long-term results. We highly recommend you buy EVLUTIONNUTRITION SLEEPMODE. Not only will you sleep like a baby, but you’ll also improve your quality of life for years to come.